I seriously had so much fun this morning working with Clorox and WPIX11. As you know, I’ve teamed up with Clorox to help promote their new e-book, ‘If Mom Had Three Minutes’. Thousands of women submitted tips online and Clorox selected the best of the best and packaged it nicely into a free download. This morning, I headed down to the WPIX Channel 11 studios in Manhattan and had the opportunity to be interview by the beautiful Frances Rivera and…. the infamous Joan Lunden. Um HELLO! That was absolutely amazing. Sitting besides me was the author of the e-book, Karen Kaufman Orloff. The clip isn’t embeddable at the moment – but I just couldn’t wait. Click here to check out the segment. Looking for the e-book? 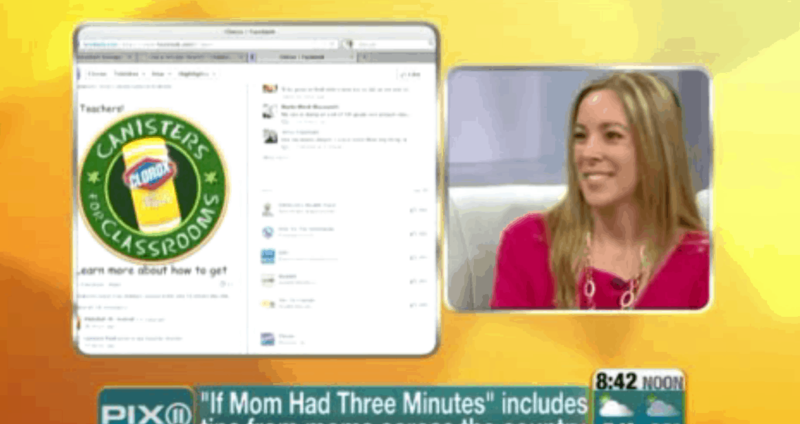 Click here to download ‘If Mom Had 3 Minutes’. Previous Post: « Mama’s Got Her Own Embroidering Machine… No Really!